Yesterday we brought you details of the February version of Air France KLM Flying Blue's Promo Rewards. As we mentioned at the time of posting that availability for the new routes wasn't showing yet. 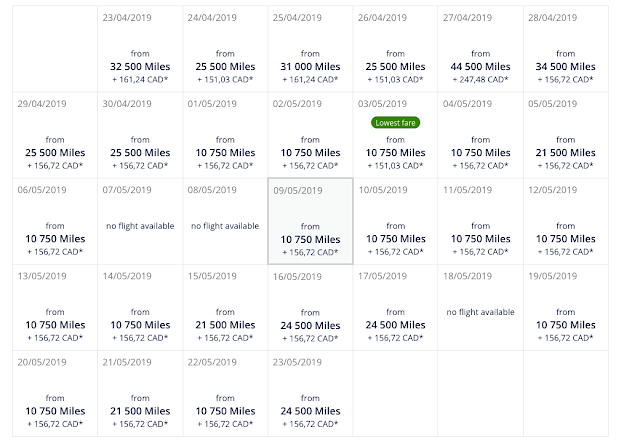 Well now this offer is live and here are some examples of availability and routes you can get this deal on, especially so for the great offer of 50% off economy and business class seats out of Montreal! That's not too bad of deal either! 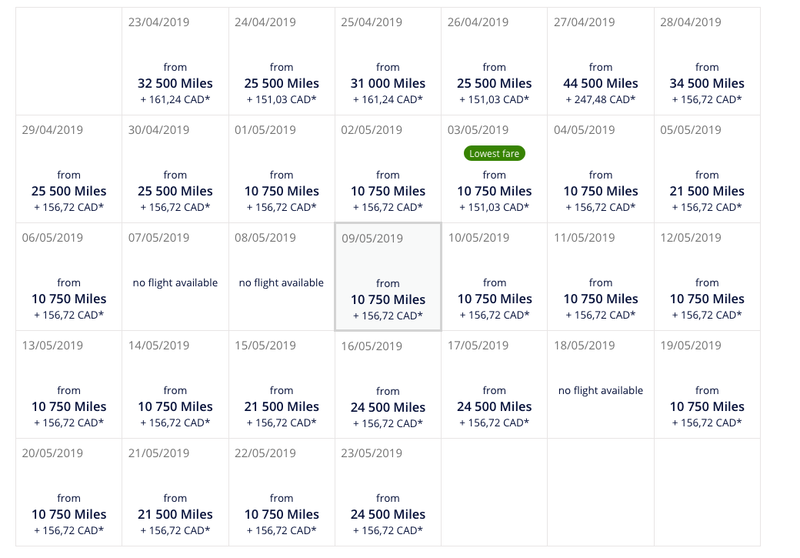 The above however shows the weirdness in Flying Blue's non-award chart pricing. Most European cities are pricing at 53,000 miles out of Montreal but when you look at Edmonton it is 91,500 miles to Amsterdam however to Milan it is only 87,000 miles! 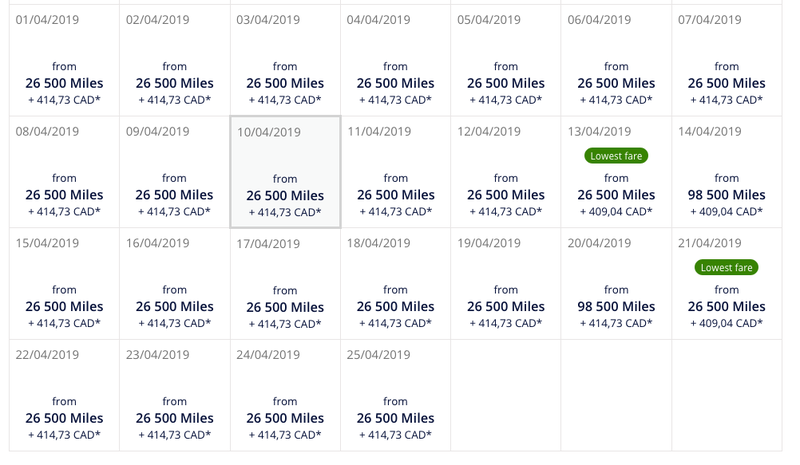 No matter what it looks like there is lots of availability for April and May out the Canadian cities to Europe and the Montreal flights are an amazing deal for either Business Class or Economy Class! If you don't have enough Flying Blue miles for a Promo Reward your best bet is to convert Marriott Rewards points to Flying Blue on a 3:1 basis. 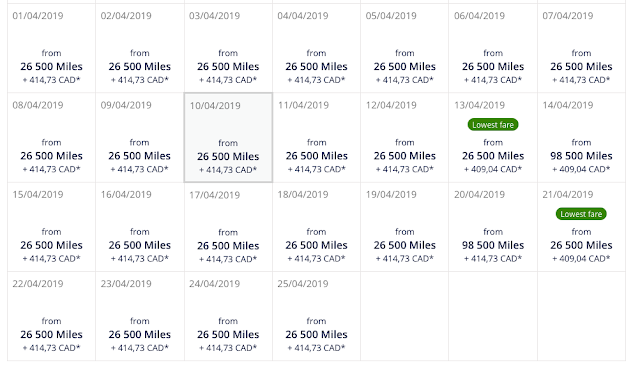 Remember you'll earn 5,000 bonus miles when you convert 60,000 points at a time (a total of 25,000 miles per 60,000 points) That means 129,000 points will get you to 53,000 miles which is enough to cover the round trip Montreal to Europe flight in Business Class! Or just convert 60,000 to get the 25,000 miles which covers the round trip Montreal flights in Economy Class. If you want to build up your Marriott Rewards Points balance you can always look at getting the Starwood Preferred Guest Credit Card from American Express. Currently the card comes with a 50,000 point sign up bonus when you spend $1,500 on the card and then you could also grab the Starwood Preferred Guest Business Credit Card from American Express as it also has 50,000 point sign up bonus. You would then ultimately be able to have 100,000 points not including what points are earned on spending. Of course timing of getting the card(s) now, spending and getting the points will likely not happen for this month but it sets you up for future offers. Need to grab two tickets for an itinerary? You could choose to get one SPG card for yourself and one for your partner or spouse and you'll have a lot more points!